Emma Hardie prides itself as a brand in supporting complexions of all ages and skin concerns with a multitude of products to choose from. The Moringa Renewal Treatment Mask serves up hydration, radiance, firmness and clarity in a 75ml tube adorned with instructions and expert tips. This creamy renewal mask sat on the back of my hand, the familiar scent rising and my hand transformed from something that looked as though it was being dried out for some culinary purpose. Before you all chorus, I am aware the back of my hand is a completely different aspect to the skin on my face, but, I had already 'done' the face several times and as I write this I have the product sitting on my hand, I like to have contact with the product as I write, it inspires me. So it sits on the back of a very dried out hand, I then massaged it in and voila, one hand looked immediately better than the other and it still looks rather smooth and less, wizened. 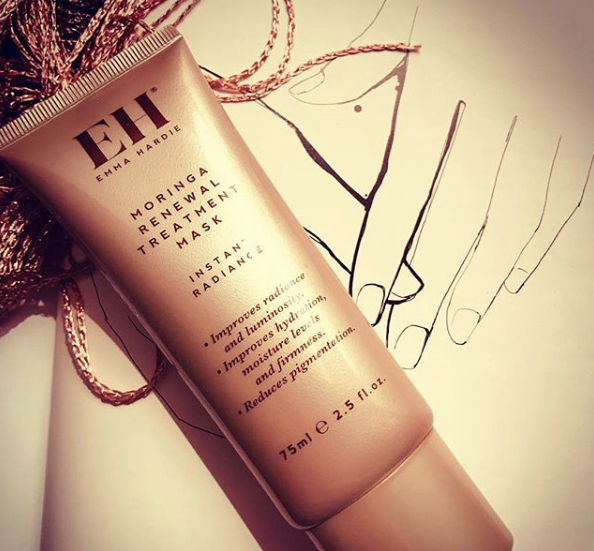 Certainly, the residue from any excess product I have applied to my face will be worked into my hands, it actually performs better than most hand products I have used, but, what did and does it do for my face? 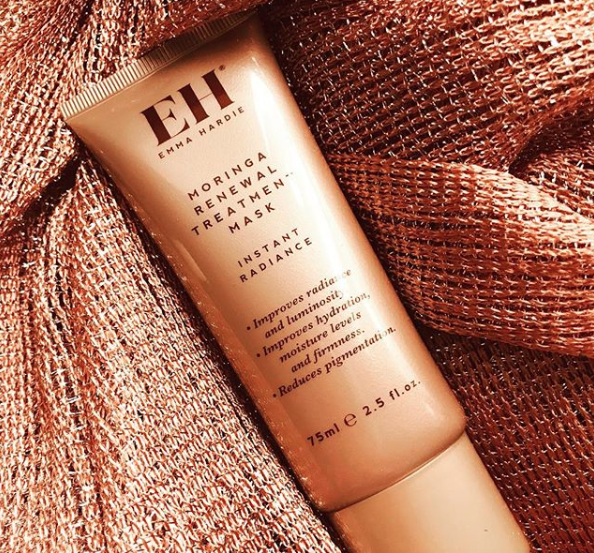 Emma Hardie's renewal mask is creamy, I love the rich texture, it doesn't dry down which often feels suffocating for my skin. At the moment I instantly feel the mask improve the texture of my skin, it does have dehydrated areas due to nightly use of Azelaic acid and I find this mask is my TLC rescue package as part of my morning routine for my skin. When I can stand it no longer, I do forgo my acid and blend this mask all over my face and sleep in it, by morning I look like I've had a hundred-year sleep and my skin doesn't look dull and grey, luminous and brighter are the visible signs. My face welcomes the hyaluronic acid it gives me moisture and lessens the dehydrated look, red algae and an amino acid derivative are to thank for that luminosity and brightness, which reflects back at me as I, critically, look in the x3 magnification mirror, my eyesight is that bad! Emma Hardie and Moringa Seed Oil are synonymous with each other, Moringa has it all, antiseptic, anti-inflammatory, moisture retaining properties, skin barrier protection from the environment, it's one of the best oils and works for my skin, I am particularly comforted by the anti-inflammatory aspect, currently. To really give skin a boost this mask can be kept in the fridge, perfect to apply before a function and a cooling, a skin uplifting treat, be warned, if you live with anyone who doesn't read labels and assumes everything in the fridge is for consuming, not looking at anyone in particular, but, I would be cautious around my husband, it would end up on his toast, store carefully. Emma Hardie Moringa Renewal Treatment Mask is the answer to 'do I need another face mask? ', yes, you do, and here it is! #ad denotes products that I have been paid to feature or the links are affiliates. #ad/#pr product sent, no payment received, for me to feature the item, purely my choice to review with no prescribed words from the brand or agency. #ad/#affiliate - there are affiliate links or trackable links attached to this video, these earn me a few pence when clicked (these appear as fav.co or bit.ly after listed products), certain links are not affiliated and are purely there for you to click and find the product information faster, these may be trackable links by the page. #ad/#sponsored products or video has been sponsored by a brand or agency. #ad/#bought/#pr - I have bought the items but had pr previously. #ad/#gifted - sent by brand or pr for my own use and I’ve chosen to share it.